A Birder, Fisherman and Nature Lovers Paradise, this private Garden Route nature reserve is almost as good as a game lodge. Zebra, many species of buck and Ostrich roam freely. If you're looking for vibrant nightlife, restaurants and queues, then this is not the place for you. Ballots Bay is a nature lovers paradise which is quite unspoiled by development and a place where you can still catch your own fish, while braaing a boerie on the beach. If you need a proper family holiday, where you value conversations more than high speed connections - this is your getaway! All along the Garden Route lie little pockets of coastal forest - and Ballots Bay is one of the places where the old growth forest still has towering yellow woods, stink wood and iron wood trees - somehow spared from fire, farming and logging pressures. Much like the drive down through the Kaaimans en route to Wilderness, Ballots Bay has the same majestic indigenous forest where the magnificent Loeries and monkeys can often be seen. Much has been done to keep the forest wattle free and preserve the indigenous species. On the open plains above the bay, a number of wild animals roam such as Bontebok, Ostrich, Zebra, Grysbok and smaller varieties such Porcupine and Bush Buck. Ballots Bay also has a small stone chapel, perched on the hilltop for intimate wedding ceremonies. When you arrive at a picnic spot and there's a good braai grid and stand - you know your day is heading in the right direction! 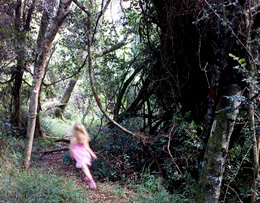 Enjoy a walk through the long and winding Magic Forest route that takes you through old growth Knysna Forest with its towering stinkwood, yellowwood and ironwood trees. These trees are possibly a few hundred years old and it's inspiring and surprising that they have survived in this secluded forest ravine. 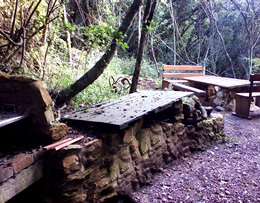 The Magic Forest is located on the hill top on the Ballots Heights side and the wonderful walk is accessible from the firebreak path (where you will likely spot the Bontebok and Ostrich) that leads all the way down to Cleopatra's pool - where you can take a dip in the ocean or head out of the forest through the Ystervark Pad for a picnic under the forest canopy. There's even a flush toilet in the trees! Ballots Bay is made up of two main areas. The most obvious is the bay area, which leads down to the pebble beach and the other area, is Ballots Heights - which is perched up above the bay and along the rugged coastline. 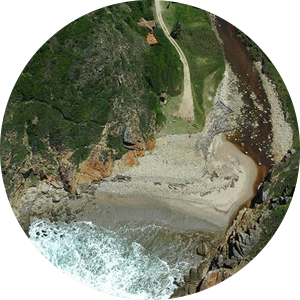 The view from above is spectacular and allows visitors and residents access to some of the most scenic walks along the Garden Route. The aptly named Fynbos Trail, winds gently down the eastern slopes through coastal fynbos and grassland. Further down and closer to the ocean you will find the Whale Trail, where it's quite possible to spot dolphins and whales within season. The Magic Forest (mentioned above) has it's own scenic route that leads all the way through a beautiful forest down to the crashing ocean below. The final descent is way more strenuous than the top part and you would want to be prepared with a warm jersey, food and water for when you reach Cleopatras Pool and the ocean below. Back in the bay area is a trail called Die Oumans Pad. This trail follows the upper forest contour and then winds gently through the bay area forest, dropping out onto the winding mountain pass. At this point you can descend into the bay on foot or walk back up the the trail head on the pass. All the hikes in both Ballots Bay and Heights can be accomplished within an hour or two and are rated easy to medium (except Cleopatras Pool walk). Suitable footwear and sun protection is advised and always be on the lookout for snakes. This is after all a nature reserve and wild animals roam freely. Go explore and enjoy the majestic views, fynbos scents and forests sounds. Ballots Bay has two amazing beach braai spots - complete with table and seating for 8 adults each. The forward braai spot has a teak table and benches and is situated right on the pebble beach with the braai up against the cliff side. Making a fire and enjoying good company on the beach has never been this good! The rear braai is only slightly further back and is sheltered from the wind by a lathe screen for when the afternoon breeze picks up. It has stone and wood seating and a proper chimney to keep smoke out of your eyes. Both braai spots are excellent for those lazy afternoons when the sun and breeze dazzle your day by playing nice! A few steps further back is a clean flush toilet so your beach braai is kept civilised. This is true Garden Route magic - and you are welcome! If you're a fisherman - then you will most definitely want to take a +10ft rod with you and some pilchards! 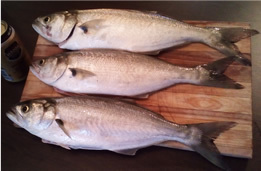 The bay area offers some excellent fishing throughout the year where you can target Elf, Kob, Blacktail, Zebra, Roman and Galjoen. Over the years, the local fishermen have built a lovely path over the rocky coastline, with a ladder in the most difficult place. On the best spots at the point are rod holders so you can relax and take in the view while you wait for a hookup, safely above the rolling swell that sweeps into Ballots Bay. Landing bigger fish from the point cliff can be a challenge, but if you confirm a Kob hookup you can walk back 30 meters and bring it up on the nice angled rock shelf. You can look forward to targeting these species - with Elf, Galjoen, Blacktail and Kob being the most common. For your convenience, the most commonly targeted species are listed below, with the minimum size and daily bag limit. It is also rumoured that you can spin for Garrick/Leervis in the surf, but it's not confirmed as the above are. It is also rumoured that small Tuna have been caught off the point in December. Remember, take only what you need for today and come back tomorrow when it's fresh! Ballots Bay is a private nature reserve and the same laws that govern our coastline apply here. You will need a permit for angling and bait collecting and size and bag limits apply. Stywe lyne! And in the unlikely event that you've had enough of Ballots Bay or just want to explore the region, here's a list of places to go and things to do close by. a most unique and private setting. 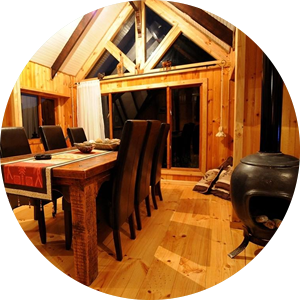 The Tree house is most unique, in that it's both a beach front home, located in a cliff side and totally surrounded by Milkwood trees. It comprises of 3 bedrooms downstairs and the open plan lounge, dining room and kitchen upstairs - connected to nature by a generous deck with mountain, river and seafront views. Amazing! it really is a hidden gem. The Bay in Ballots Bay opens to a truly beautiful pebble beach with a lagoon on the one side and two wind protected braai areas on the other, complete with toilet and shower. Spend your day playing on the rocks, skipping stones in the lagoon or casting a line into the sea. When last did you braai ON the beach? and the Garden Route Mall. So close and yet so remote! Locations like this usually mean an hours drive back to the nearest shop - but not here. It's only 6km to Victoria Bay with its world class surfing and swimming beach. 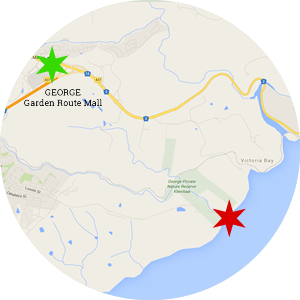 7km to the Garden Route Mall with everything from a Woolies to cinemas and restaurants. In the other direction its 8km to Wilderness with its long beach and beachfront restaurants. Just below the house and slightly removed is a communal braai area where residents and their guests can enjoy a braai on the beach! There are 2 different braai spots, one closer to the sea and the other slightly set back and protected from the onshore winds. There is a clean toilet and outside shower for your convenience too. Because Ballots Bay is inside George Private Nature Reserve and therefore not accesible to the general public, you are safe and crowd free. You will meet only local residents or holiday makers and the atmosphere on the beach is friendly and relaxed. Say "Hello" and spend time chatting to happy, friendly people!